The NPR Planet Money segment cited below is excellent. I’m really glad that they reached out to Jane Margolis and Telle Whitney to get the history right. In the early 1980’s, interest in Computer Science spiked. There was more interest than there were seats available in CS classes. Eric Roberts talked about these times in his keynote at the Future of Computing Education Research workshop in January 2014, which I blogged about here. What to do with the burgeoning enrollment and no additional resources? Caps were put into place, and classes became harder. Berkeley raised their cap until you had to have 4.0 in all your pre-requisite CS classes to get accepted to the major. Eric Roberts was chair of the CS department at Wellesley in the early 1980’s, and he told me about introductory CS classes at MIT with insane workload, where only the boys with lots of prior CS experience and who were fanatical about computing were getting through. Jane Margolis and Alan Fisher talked about this phenomenon in Unlocking the Clubhouse when they describe how the men and women in the CS classes at CMU had different views of the computer, which influenced how they interacted with it and how much time they were willing to put into their classes (nice summary of this story is on Wikipedia). The classes may not have been made harder explicitly to deal with overcrowding, i.e., to “weed out.” It may have happened in response to an influx of boys who already knew a lot from playing with their PC toys, compounded with a lack of resources because of the overcrowding. With boys who already knew a lot, CS teachers could start skipping over topics, or covering them lightly, or just assigning programming tasks so that the student “figures it out” on his or her own. If a student can’t learn with this approach, then teacher might decide that the student just “can’t” learn to program. Maybe the student doesn’t have the Geek Gene. Some students do succeed with this approach, because they know a lot from prior experience (or have the Geek Gene). Now, put this in the setting of high enrollments and tight budgets. A student with lots of prior experience needs less teacher time to succeed. A student with less experience needs more time and effort in order to succeed in CS classes. In lean times, there are fewer resources for teaching, and those with less experience will not get the resources they need to succeed. Students with more experience will succeed just fine, so we continue to have high-quality CS graduates who get good jobs. Unless we look carefully at who is succeeding and who isn’t, we might not even notice that our program now presumes prior experience in order for the student to succeed. What’s scary is that we may now be following the exact same path. Eric has been warning about this for some time (see blog post). Enrollment in CS is exploding nationwide. Now, the caps are starting to be put into place. Berkeley now requires a 3.0 in the pre-requisite classes to get in to the major. Here at Georgia Tech, the College of Computing has just requested to have a grade requirement in pre-requisite CS classes before allowing students to transfer into CS. It’s still the case that it’s mostly wealthier (middle or upper class), white or Asian males who get access to high school CS. That’s in Barb’s AP analysis that got so much coverage this last year (see blog post here and the media coverage here). AP CS is the most gender-skewed AP (more male than AP Studio Art is female). So, even if you’re in a school that can afford AP, women will most likely not be in the CS class. In our AP analysis SIGCSE paper last year, we showed how wealth in a state has a strong relationship with AP CS offerings in the state. We’re now starting to show the relationship continues to the district level as appeared in this blog a few weeks ago. First, the students who succeed the most in intro CS are the ones with prior experience. Second, creating these kinds of caps creates a perception of CS as a highly competitive field, which is a deterrent to many students. Those students may not even try to get into CS. It looks likely that we are going to reduce the diversity in CS, again. While on our watch. Mark Zuckerberg. Bill Gates. Steve Jobs. Most of the big names in technology are men.But a lot of computing pioneers, the ones who programmed the first digital computers, were women. And for decades, the number of women in computer science was growing.But in 1984, something changed. 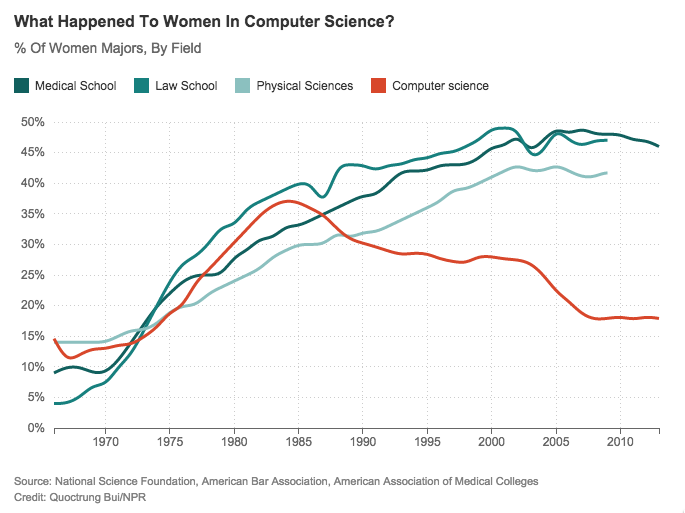 The number of women in computer science flattened, and then plunged. via Episode 576: When Women Stopped Coding : Planet Money : NPR. Many in the ideas for this blog post came from discussions with the Diversity Task Force of the ACM Education Council. All the mistakes are mine. Entry filed under: Uncategorized. Tags: BPC, NCWIT, public policy, women in computing. Going beyond the cognitivist in computing education research questions	The challenge of turning business teachers into CS teachers: Where’s the passion? The 6,000 student all male high school I attended in the late 60s/early 70s had a computer. Obviously not many could learn how to use it so the bar was set at getting an A in Calculus as a junior. Math not being a strong suit I didn’t get to touch that computer. Fortunately the much smaller college I attended had no such bar to learning computing. I am a member of the last group of “women who coded” – I graduated with my BS in 1982. Around 40% of the kids in my major were women. I was in grad school from 1983-1988 so I saw the transition. This show got it wrong, in my opinion. Back in the 70’s, lots of schools had computer science, including my high school. And our programming classes were harder than the ones today, not easier. I can’t imagine my current students completing the projects we had to complete. We also had more math requirements than today. What changed was the advent of the PC, and the transition from computer-as-useful-tool to computer as toy. Once computers became toys for gaming, they became cult objects rather than tools. They also became isolating. When I majored in computer science, it was an extremely social major because we all did our work in the big computer lab on campus. The atmosphere at 3am before the big projects were due was wild, with everyone joking around while frantically debugging. Once the PC took over, it became accepted that you would curl up with it all night in your dorm room, never talking to anyone else. And finally, the rise of gaming culture, which happened in the late 80’s, really drove women out. While I know there are female gamers, and lots of women play Angry Birds, I think the relationship of women to gaming is inherently different. Most women play games as a diversion. Men often start seeing games as the main point of their lives. Gaming developed into an increasingly hostile world for women and contributed immensely to the sense among girls that computers were not for them. I wonder if today’s more light weight Facebook and mobile games, which a lot of women do play, may help change that perception. My son attended a programming camp last summer. The advertising for the camp prominently advertised that they stocked all the latest games for the kids to play during break. This seemed to be the main social activity at the camp. That, and the photos on the website, all of boys, simply screamed to girls “This is not for you!!!”. And indeed, there was only one girl among the 50 or so kids. There are promising signs. My district has finally started a middle school programming club, where they are using Scratch. There are lots of girls in the club, and I have met with teacher to discuss projects that might appeal to the girls. The teacher is very passionate about keeping the girls interested. One thing she wants to try is doing some wearable computing projects because the girls seem excited about that. I really hope that this generation of girls can learn that computing can be fun and social, that it isn’t just about boys holed up in their rooms playing games. I don’t disagree with the concerns you raise, Bonnie, but I do disagree with “lots of schools had computer science.” From the data I’ve seen, only about 25% of high schools had computers by 1986, and a much smaller percentage than that actually taught CS. My high school did not have a computer, but they did teach computer science. How? They had a teletype connection to the local university. My husband’s high school did the same. So data on computers in high schools is misleading. I learned to program on a KSR-33 Teletype in high school, too. But your experience, your husband’s, and mine don’t constitute data. There’s no one who was counting the number of schools teaching CS in the 1980’s (as far as I can tell). The numbers we do have don’t suggest computer science as being common in high schools, e.g., the stats on AP CS from 1984 forward, the amount of Logo in schools, and Larry Cuban’s analysis of how computers were used in schools in the 1980’s (and this interesting effort comparing 1998 to 1980’s). I had it made. My high school had its’ own PDP-11. That was back in ’76 – ’77. We sat in the same room with it. Bonnie, I graduated with a BS in Computer Engineering in 87. There were 10 in my graduating class, and 3 were women. In CS it was about the same – 30% female. Until we change the culture in most intro programming classes (all programming, who already knows the most, solitary assignments, assignments centered around more male topics) it won’t be a particularly hospitable environment for women. I completely understand the argument. I doubt that any department will use a lottery for just this reason. I teach in a program where very few of our incoming students, male or female, have had any prior exposure to computer science, either in school or out of school. So we run our introductory sequence at a level that truly assumes no background, and take 3 semesters to cover what many schools cover in 2 semesters. So in many ways, I think we are trying to address some of the equity issues you bring up. Our program is about a quarter African American, and a quarter Hispanic. But even the Asian-American kids come from low income backgrounds and seem no more likely to have had prior exposure to computer science than the African-American kids. But still, many of them struggle terribly. The issues are not caused by lack of prior programming experience. They are caused by lack of high quality high school courses in math and English. We are now considering a cutoff – C or better in the first 2 CS courses – to continue in the program. We generally are finding that students who get D’s in the first 2 semesters have trouble succeeding in later courses. I do not think that would affect the few women in our program, who generally do well in the first 2 semesters. But it would have a dramatic effect on the number of African-American men who continue in the program. I just don’t know how we can make up for the poor education they received in K12. And that, I think, is where the true inequity lies. It’s often so hard to be objective when it comes to perceptions of equity. As Anatole France observed, “In its majestic equality, the law forbids rich and poor alike to sleep under bridges, beg in the streets and steal loaves of bread.” They open question is whether those students truly are higher achievers, or if they are just starting from an advantageous position. In that case, would it not be more equitable to give the opportunity for students who did not have prior opportunities? Somone really needs to clean up that data over time by now. Around 25% of all degrees in the computer science field recorded by the US Dept of Education (and more in some years) come from for-profit or not accredited, “diploma mill” schools. The trends for those institutions should really be separated from the trends for other institutions. which brings us to “d”. This is essentially saying that schools are failing certain groups of students. If that’s the case, then that’s where the problem needs to be solved. There’s not a lot much point in worrying about undergraduate teaching if female students are already behind by the time they get there. If there is bias influencing “d,” then the most ethical choice is to do a lottery among all applicants above a particular bar. I do understand the concerns (well expressed by Kevin), and I’m sure that it will never happen. I most disagree with your last sentence. I’m not willing to give up quite yet. There are different ways to teach (see previous blog post), we might be able to secure more resources for more seats, we might be able to do something outside of school contexts, we might be able to influence K-12 education, and we might invent new options. But there is point in worrying, and the problem is worth exploring solutions. If you were interviewing for a teacher at your school would you employ the best candidate, or would you hold a lottery of all applicants who hold a teaching qualification? Which would you consider ethical? How would you feel as a stong applicant in each case? I don’t mean “give up”, as such, but rather direct effort and attention to the cause of the problem, rather than pouring effort into addressing the symptom. Influencing K-12 is exactly the solution I suggested. I think you should be a little more critical of (c) — how valid are our measurements of how qualified students are? Are we really believing that grades are a perfect measurement of student aptitude? There’s evidence that higher grades in CS1 are in part due to prior experience. If we take grades as our measurement we will see a rich-get-richer phenomenon, rather than if we tried to measure how much learning /gains/ a student had. Grades are an indicator of how well a student does in the current system — which can be set up to subtly penalize or uplift students of different demographic groups. Is it really that male students are better qualified, or is it that the system is judging qualifications in a way that favours male students? I’m 5 years younger than Bonnie, from the era when girls stopped coding. In my first programming class at Berkeley, we used terminals hooked up to a mainframe in a large classroom with a TA roaming around the room. During my junior year, Sun donated a bunch of workstations and installed them in a new classroom with 4-6 workstations per cubicle and about 50 terminals total. The TA sat in one cubicle and could not see what was going on in the other cubicles. In my last programming class, in my senior year, I had to sit in a cubicle with 3-5 boys, all downloading pictures of scantily-clad women or gaming while I tried to focus on my homework. When I complained to the TA, he told me that policing the guys was none of his business. Is it any wonder that the % of women taking CS classes at Berkeley plummeted at that time? We also just put a prerequisite in place that requires a B- in our first course to progress to the second. However, we’ve done a number of things that (hopefully) mitigate some of the problematic effects of this. First, we have two intro courses: CS 139 is designed for students who have never programmed before and CS 149 is for students with experience; both sets of students go on to CS 159. Second, our CS 139/149 courses aren’t truly CS1. What typically goes into a CS1 is what happens in CS 139/149, along with about half of CS 159. So our intro sequence is deliberately resource-intensive to provide opportunities for students with no background. Third, POGIL and pair programming. A lot of us here find considerable evidence in the literature that cooperative learning techniques can have an impact on female perception of the field. All of our intro faculty use some form of cooperative learning, and some of us use them at higher levels, as well. Impressive, Michael — let us know how it works, please. Does whatever diversity you see incoming to 139/149 persist into the graduates of 159? I should have been a little clearer on one aspect: The structure of CS 139/149/159 has been in place for a few years, so it predates the new B- requirement. We haven’t done a detailed analysis, but our informal interpretation is that our male retention rate from CS 139/149 to CS 159 is (artificially) higher than it is for females. I say artificial because we have a large number of male students who struggle through CS 139/149 and CS 159, but fail to complete the major later. So while our weakest female students leave before CS 159, our weakest male students leave after that, and our overall retention rates are fairly balanced. The question that we have right now and what we’re watching for is whether adding the B- prerequisite to CS 159 hurts recruitment for females into CS 139. Recruitment is definitely our big problem right now, as our demographics for CS 139/149 are less than 20% female (which is comparable to what I see in 400-level courses, adding to the previous statement that overall retention is gender balanced). We are concerned about the possibility that this requirement makes the major seem harder and turns away potential female students. But we won’t know for a while. Lastly, one thing to note about the CS 139/149/159 structure is that it was also put in place to support other notions of diversity. We’re located in western VA and we have a lot of students that come to us from rural parts of VA, WV, and PA. Many of those students come from economically struggling districts, and our curriculum offers them a way into the field with no prior background. I agree that a more rigorous analysis is needed, and I do want a better picture of what’s going on. I especially want to take a look at it now because we’re introducing a new structure to our upper-level systems curriculum and I want to track the effects of that, as well. I remember this was a topic of discussion during the Rebooting Computing Summit, back in ’09. Someone brought up a longitudinal study that looked at this, beginning in the 1970s, and came to a somewhat similar conclusion: The PC, and dominant gender biases in our culture re. its pertinence, were a major factor in disadvantaging girls in the discipline. Another aspect that was explored was the fact that before the PC, the genders were more on a par with each other, not just because gender biases were less prominent (due to an engineering culture that was starting to encourage women to participate), but because the activity was different. Participants noted that prior to the PC, men and women came into CS on an equal footing, since in most cases neither had prior experience with computing before enrolling at a university. Computers were too expensive for most consumers to buy, and so neither gender, generally, had a head start on the other. Secondly, with computer time being precious, students had to be more careful in their thoughtfulness towards their programming. They had to think through what the computer was going to do ahead of time, because they may not get a result back for hours or days. Women reported feeling more comfortable with this slow style of work. What was reported to dominate with the PC was a fast-paced, trial-and-error approach. Male students seemed to thrive in that environment, whereas girls reported not liking it as much. Not to say that the PC forced this style of work, but that it allowed it. When you can get instant feedback, being sloppy, and not adequately forming a model of what’s going on, doesn’t become expensive except via. exasperation, when repeated trials result in no improvement of results. A third aspect that was reported (that I remember) was that women were attracted to CS in the 1970s because it was a pathway to a lucrative career. Women could gain a higher salary in computing than they could in most of the other professions that were available to them. This gradually changed in the 1980s, and beyond, when more career opportunities opened up for women outside of CS, which paid better. As this happened, women didn’t see CS as a path to that lucrative career anymore. Plus, these other options may have also had better career stability. The computer market was by then known to go through boom-and-bust cycles. A theme I’m noticing as I write this is that economics dominates the entire description of the practice. It was a while ago when I saw this, so perhaps I’m only remembering the economic aspects of the study. I am a bit suspicious that perhaps economic considerations were a bias in the study, but perhaps they dominated (and continue to do so). I have a lot of sympathy for the underprivileged that start college already behind. But the proposed solution to the problem (i.e., let’s not use GPAs to gate entry into the CS major) is a terrible idea. In an age where already most CS majors can’t program their way out of a paper bag, do we want yet more unqualified CS majors who can’t code? And what message does it send to those who *are* prepared for the material because of an early head start or hard work? That your preparation and hard work is for nothing? That you might lose your position to someone else because of your skin color or gender? Or an unlucky draw of the lottery? I also take dispute with the moaning and groaning of the “shortage of resources to support CS education.” Google, Facebook, Apple, and Microsoft are making money hand over fist. Where are the “Google-sponsored faulty positions”? Does Facebook give money back to CS education? There are plenty of resources, and if industry keeps complaining about the shortage of computer scientists, it should put its money where its mouth is and put up. And of course, Universities are not blameless. Even in the depths of the CS bust (around the 1990s when I was in school), UC Berkeley, with its notoriously low pay, was getting 800 applicants for every tenure track faculty position open. It’s a travesty that Universities are not scaling up to match demand. Regardless, a better solution would be to ensure that the underprivileged who are behind when they start school get extra support and faculty/TA attention. And there’s nothing wrong with sending the message that “you’re behind, you’re going to need to work extra hard to catch up.” Every workplace I started at (except the ones where I was a founding member of the team) put me in that position and I had to cope. Better that students learn that while in school, because for the rest of your life you’re always going to be catching up. Take a look at the argument from the Berkeley student — people want to know about coding, but not to become professional software developers. Yes, we want more people who only code “some” because there’s where most people will be. Those people shouldn’t be CS majors, any more than needing to know a little math means that everyone should be a math major. But they should take CS classes. And some will find their passion and become CS majors. Why shut that path down? Taking CS classes doesn’t make you a CS major, any more than taking a math class makes you a math major. The introductory CS classes aren’t gated (as far as I know). It’s becoming a CS major that’s gated by your grades. But taking an introductory CS class and getting a C shouldn’t qualify you to be a CS major, just like taking an intro Math class and getting a C would almost certainly bar you from becoming a math major. Skin color and gender shouldn’t be part of the qualification process. If you’ve never seen CS before you get to undergrad, you can get a C in that first class — and still fall in love with it and pursue computing as a major. Happens pretty often, in fact. Then the solution is to get a longer runway to those under-prepared. Remedial English, remedial math are common in today’s universities. Nothing wrong with adding remedial CS to the mix. From your mouth (er, your keyboard) to God’s ears! But if we don’t have resources to cover existing courses, how do we create remedial CS? CS for all majors? CS for those without prior background? Where do the resources for remedial math and english classes come from? UCSC has a number of courses that I could consider “remedial CS”. The course that used to be the sole intro course now has a 2-quarter “equivalent” course pair, and there are lower level courses for students who want a lightweight programming class before tackling what used to be the first course. Mostly, the “remedial” CS courses are a good thing, but too many good students who could handle the original first course are pushed into the slower paced courses, which takes up course slots and reduces the number of more advanced electives they can take. There is a gender and minority bias in who gets recommended to take the slower sequences also.